What would the world look like if more women had a seat at the leadership table? Homeward Bound is a ground-breaking leadership initiative, set against the backdrop of Antarctica, which aims to heighten the influence and impact of women in making decisions that shape our planet. These are delivered through online content and collaborative learning for almost 1 year, followed by additional learning in Ushuaia, Argentina, and also on-board the ship in Antarctica. I am over the moon to be selected as a member of the HB4 cohort for 2019! Out of 95 women selected, there are just 2 members based in Ireland. Despite making up 45% of the global workforce, women are globally underrepresented in leadership positions. This is despite women comprising 57% of recent college graduates. By providing these women with leadership and strategic skills, a sound understanding of the science, and a strong purposefully developed network, we will enhance their ability to impact policy and decision-making for a sustainable future. Regions of Antarctica are showing the fastest responses to some of the global sustainability problems we currently face. Antarctica offers an unparalleled opportunity to observe first hand the influence of human activities on the environment and provide critical insights into the global-scale change required. This iconic environment has captured the imagination of leaders in the past and the expedition experience of the Antarctic component of the Homeward Bound program creates strong bonds between participants. If not now, when? The sustainability of our planet is in crisis and so is the state of leadership in our world. Homeward Bound aims to contribute to both these global issues. Launched in 2016, the inaugural program culminated in the largest ever female expedition to Antarctica. Homeward Bound has led two cohorts of women through the year-long state-of-the-art program and Antarctic voyage, with a third cohort underway and due to depart for Antarctica on 31 December 2018. HB4’s online program will commence in November 2018 and will conclude in November 2019 in Antarctica. I am currently fundraising to cover some of the costs by offering talks & workshops in schools, organisations & businesses before and after my trip in return for a contribution to the program fees. If you or your organisation would like to know more & potentially contribute (financial or otherwise) please get in touch by email here. You can also donate directly through my Chuffed page. You can learn more about the 95 individuals taking part in HB4. 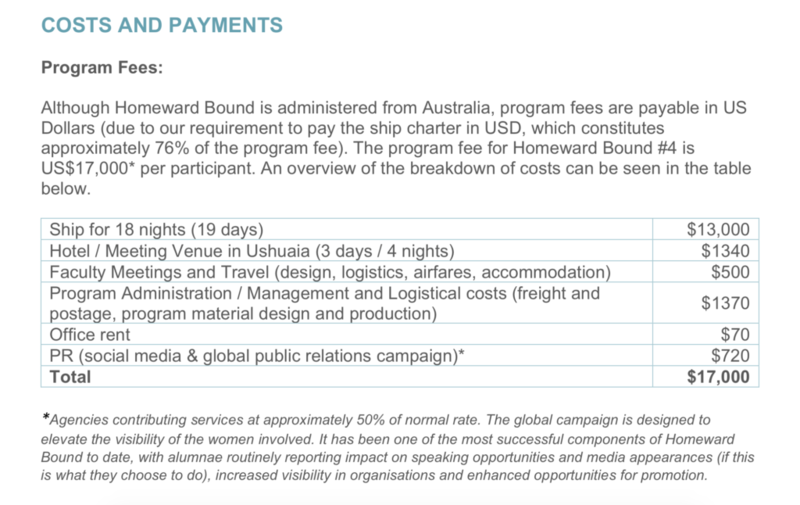 Learn more about the entire Homeward Bound project on the website here, and follow updates on Facebook & Twitter.